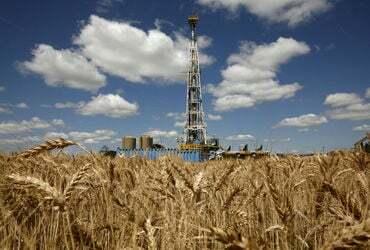 This oil rig stands next to a wheat field near Merced and Shafter avenues north of Bakersfield and west of Highway 99 in this file photo. In this file photo Murray Family Farm employee Teresa Hurtado sorts Royal Rainier cherries before packing at their General Beale Road facility. The county has been drawing attention with its new Advance Kern business incentives, and hopes to soon have companies sign up for this program, which allows eligible companies to earn tax rebates when they relocate to the county or expand their operations here. The program is being actively marketed by the Kern Economic Development Corp., which launched a website last month. Teresa Hitchcock, assistant county administrative officer for economic and workforce development, said that although the process of relocating business is "lengthy" and the program is still in its early stages since being voted on by the County Board of Supervisors in November, she expects to see an application soon. “As soon as we bring an agreement to the board...you would probably see the business up and running within the next 12 months," Hitchcock said. Richard Chapman, president and CEO of Kern EDC, said the program has already gained some attention and could be a "game-changer" for the local economy. In a state that offers few incentives and is ranked #48 in business tax climate by the Tax Foundation, Chapman said the county has taken it into their own hands to promote business. "This is an important part of the toolkit when you look at site selection factors," Chapman said. This incentive program hopes to diversify county industries from current key players like agriculture, energy and government employers such as Edwards Air Force Base. "It's about investment in the region, be it companies coming in, as well as companies expanding their local operations," Chapman said. According to an industry snapshot provided by Kern EDC, agriculture-type workers are about 20 percent of the county's workforce. Oil, gas and mining jobs declined at an average 8.1 percent annually the last five years, although oil is now picking back up. Hitchcock said that with the recent downturn of oil and mechanization of agriculture, the time has come to bring in new business. Companies that sign up must meet certain criteria, such as bringing in jobs that pay above a living wage. "We want to make sure that we're enticing people that really will impact local economy," Hitchcock said. Chapman called these types of employers "multipliers" that can help create additional jobs in related fields. Target industries include aerospace and defense and health care services. Bill Deaver, a board member for the Mojave Air and Space Port and for Kern EDC, said the incentives could help to bolster aerospace, which he said is booming, but also bring in new options, especially in the eastern part of Kern County. "The whole county needs to diversify...you can't put all your eggs in one basket," Deaver said. The county also recently received a grant from the U.S. Department of Defense Office of Economic Adjustment to implement the East Kern Economic Diversification plan. Three county employees are being hired to work with area leaders in brining a study that was published in 2017 to fruition. The primary goals of the plan, according to its text, are: (1) business development, (2) talent development and recruitment, (3) innovation and entrepreneurship, (4) tourism and visitor attraction, and (5) regional collaboration. These employees would do work similar to Kern EDC, which markets Advance Kern incentives and other benefits of doing business in Kern County. "We've got a lot to offer and some of the brightest people in the world," Deaver said of eastern Kern. The Advance Kern program also works on a case-by-case basis. Any business that applies will be reviewed by the Board of Supervisors, and a public hearing will discuss what the business can bring to the county. Joe Rentfro, executive vice president of real estate for Tejon Ranch Company and a board member for Kern EDC, collaborated in the development of Advance Kern. He said the county was innovative in emphasizing job creation and ensuring that the incentive is not given until business is developed and benefits are reached. From his perspective, Rentfro said, Advance Kern is already "helping to attract the interest of companies from outside the area." Rentfro said the program is a "safe bet" for the county, as it simply reimburses from companies' own tax payments. He also pointed out that the policy stipulates that offsite developments must be built in an area with appropriate infrastructure and zoning, thus preventing expense to the county. “We're pretty confident that it will produce that return on investment,” Chapman said. To learn about site selection in Kern County, go to kedc.com/site-selection. For assistance, contact the County Administrative Office at 661-868-3198 or email incentives@kerncounty.com. I hope the county is prioritizing the expansion of locally grown businesses over bringing in new players and helping external players expand their footprint in Kern County. While those are both great, locally grown businesses are here to stay and it has been proven that their success has the greatest multiplier on the community. A much higher percentage of their earnings are returned to their communities than large national and multinational corporations. Let's not subsidize the outside big guys at the expense of the local entrepreneurs that are already working hard to do something great for Kern County.